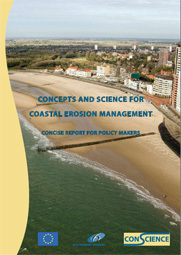 The EU-FP6 CONSCIENCE project was launched in 2007 with a view to enhancing the implementation of a scientifically based sustainable coastal erosion management in Europe. It has been testing scientific concepts and tools in six pilot sites around Europe. It has shown that the sediment balance approach can be applied for almost any coastal type, but that this approach to achieve sustainable coastline management is often hampered by lack of a well defined and institutionalised government policy for Integrated Coastal Zone Management (ICZM). 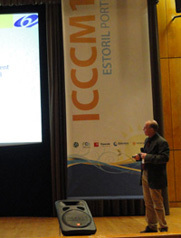 The final public event of the CONSCIENCE project, including the participation of local study sites end-users has taken place at the occasion of the International Conference on Coastal Conservation & Management in the Atlantic & Mediterranean, http://icccm.dcea.fct.unl.pt/, 11th -17th April 2010, in Cascais, Portugal.